Models. No, not the gal. What she’s working on. 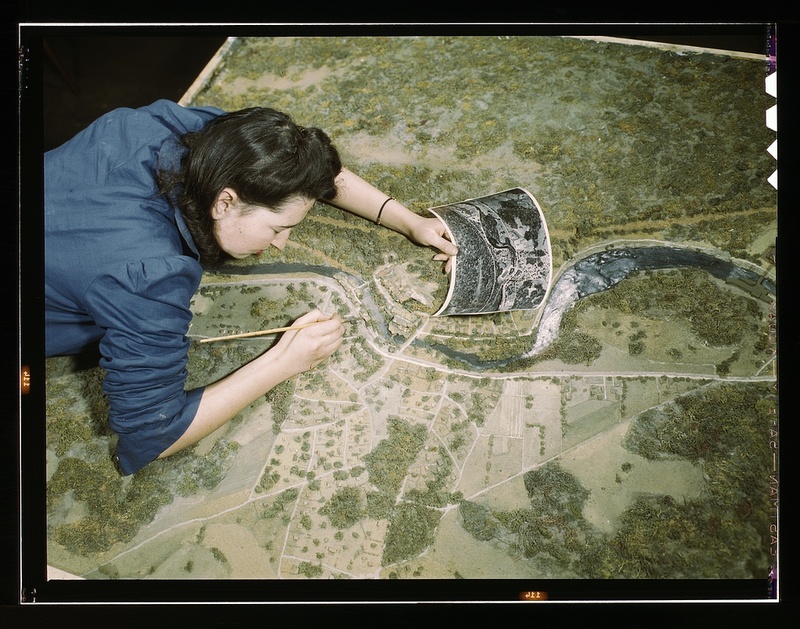 This is a shot of a WWII defense worker creating a 3D terrain model based on the aerial photo she’s holding in her hand. 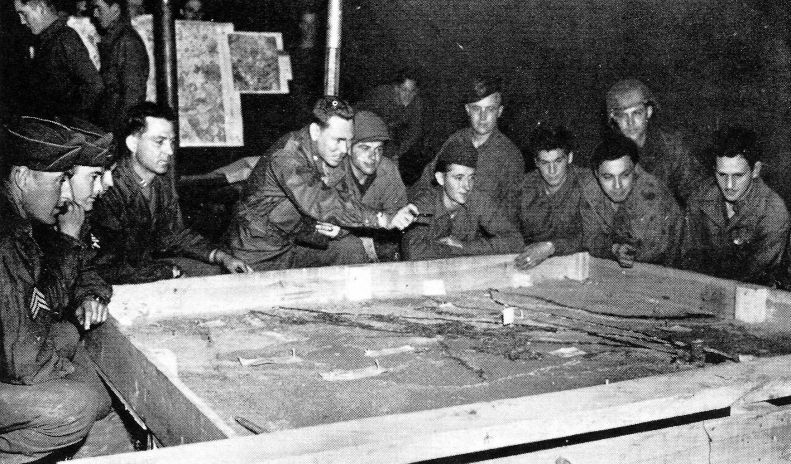 The US Army (and, I suspect, the Marine Corps) loves terrain models, and the use of terrain models for operational and tactical planning, from Army corps all the way down to squad level, has been part of our doctrine since before WWII. A terrain model is nothing more than a 3D representation of a portion of the earth’s surface. 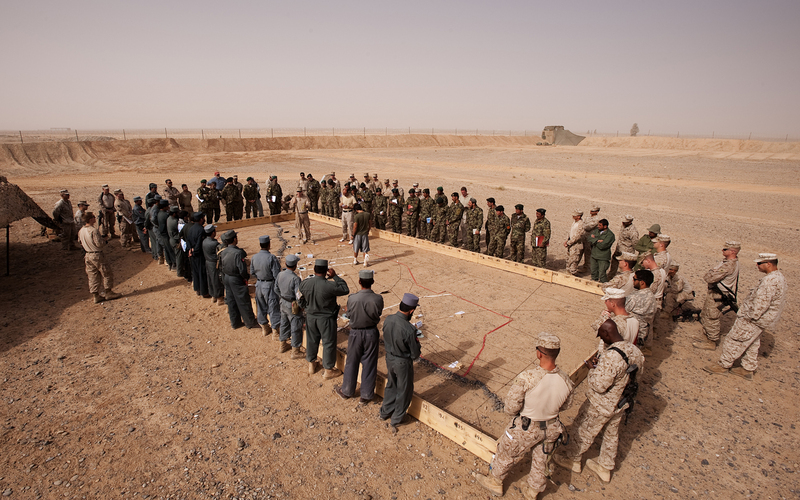 For the US military it serves as an adjunct to the topographic map and helps Soldiers better visualize the steps or phases of the operation they are about to execute. 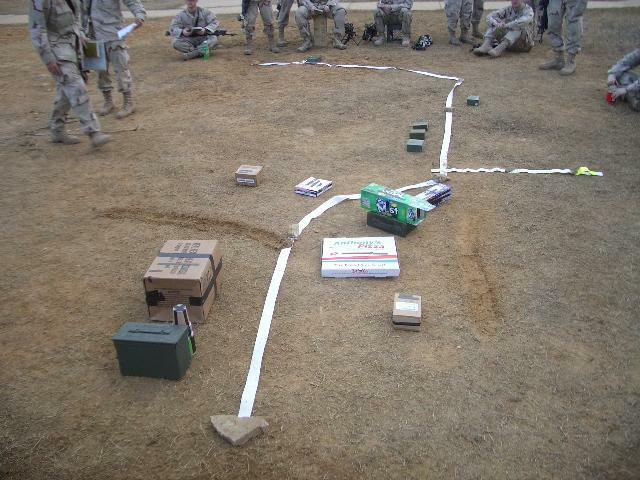 A terrain model can be something as simple as an impromptu sand table scratched out on the desert floor by a squad leader somewhere in Iraq, or a highly accurate, scaled and detail correct product built by modeling experts. One of the best examples of a professionally done military terrain model is the prison camp model code named ‘Barbara’ that was built to support the US Special Operations raid on the Son Tay Prison camp in North Vietnam. The model was built by professional modelers working for the CIA and was based on Corona satellite and SR-71 reconnaissance photos. Even the heights and crown diameters of the trees in and around the compound were properly scaled so the pilots could evaluate the best areas to set their helicopters down. And sometimes your ‘allies’ are so lacking in map reading and military operational skills that the only way to get the point across is to walk them through the operation using a terrain model. There was a US Army Forces Command (FORSCOM) regulation that prohibited using Army terrain analysis and topographic units to make terrain models, but that never slowed down eager senior commanders who just couldn’t live without a terrain model. 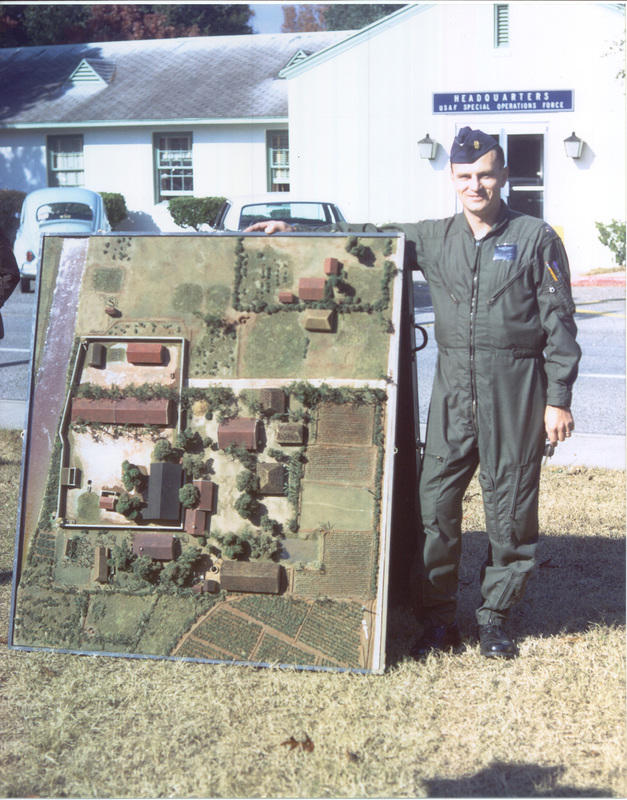 In one memorable episode in the mid-90’s the III Corps Commander at Fort Hood, LTG Tom Schwartz, directed a large scale terrain model of our operational area in Korea be set up inside the headquarters building for an upcoming joint exercise. My boss, the III Corps G2, looked me in the eye and said “get it done”. I helpfully passed him a copy of the FORSCOM regulation. Without even glancing at it he dropped it into the trash can, looked me in the eye again and said “get it done”. Yes sir, yes sir, three bags full. Thankfully the Deputy G2 had wrangled a bunch of sharp NCOs from both the G2 and G3 sections to do the actual work, so all I did was advise. Over the Christmas 1995 holiday season a terrain model of the central Korean peninsula emerged that filled the entire floor of one of the headquarters building atriums (and if you’ve ever been in the III Corps headquarters building you know how big that space is). It was made out of crushed newspaper and spray foam insulation, with hand painted details. The G2 even had little airplane models buzzing overhead on special wires to represent the early UAV systems he had at this disposal. The model was so big that our standard laser pointers didn’t have the power or reach to highlight the key areas. One of our sharp NCOs ran over to the post theater and borrowed a portable theater light with a spot filter. We set the light up on the second floor of the atrium overlooking the terrain model and used that as the ‘pointer’. By the time model was done it was like a carnival sideshow, with folks from near and far dropping in to marvel at what had to be the most outlandish and cheesy terrain model ever built. General Schwartz loved it. Today the digital world is awash in ‘terrain visualization’ software. Given the high resolution imagery and elevation datasets available for just about anywhere our military forces fight it is easy to generate realistic and accurate computer models almost on the fly. But still, nothing satisfies like a physical model (just like nothing satisfies like a paper map). That’s why digital-to-solid terrain modeling systems have come on strong in the past several years. 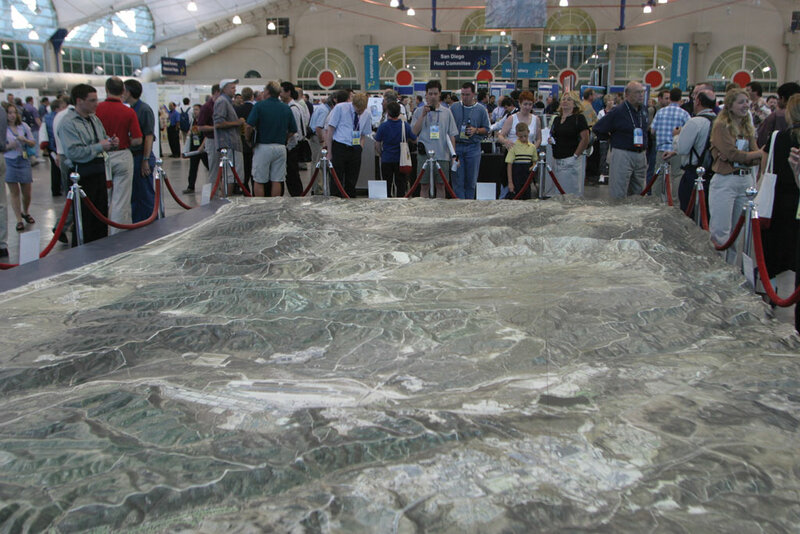 As this picture shows, when you’ve got to gather up a bunch of folks to look at a key piece of terrain nothing fits the bill like a real terrain model. So what’s on the horizon? I’m waiting for the first cheap desktop solid modeling printers to hit the market so I can crank out 3D models of my favorite fishing holes. Canon? Epson? HP? Anyone? This entry was posted in 3d, Military, terrain analysis and tagged sand tables, terrain modeling by Brian Haren. Bookmark the permalink. The movie “Objective, Burma!” has a nice sand table model early in the film. Hathitrust has digitized nearly all the Army Map Service bulletins which detail the techniques of terrain modeling. If you have access to a University or large city library, you can read the bulletins or download. If you contact me, I can supply you with a downloaded copy. Of course, for real large terrain models there is the one in China of the disputed Aksai Chin Provence with India and Pakistan (38°15’57″N 105°57’2″E). Check it out on Google Earth.